Jeremy was an amazing husband, father, son, brother, uncle, teammate, and friend. 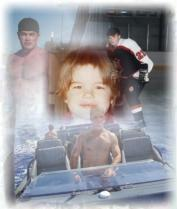 His memory will forever live on in the hearts of those who knew him. This site is dedicated to all who wish to cherish his memory forever. Special Warfare Boat Operator Senior Chief Petty Officer Jeremy Allan Crow was born on October 20th, 1974, in Hettinger, North Dakota. Upon graduating from high school, he enlisted in the United States Navy on June, 22nd, 1993, as an Electronic Warfare Technician (EW) and was stationed onboard the USS Ticonderoga (CG 47) out of Norfolk, VA in November of 1994. He transferred from USS Ticonderoga to Naval Space Center Command in Dahlgren, VA in January of 1999 where he served as the Force Enhancement Petty Officer, Space Surveillance Instructor, and later served as Leading Petty Officer. In March of 2002, he attended and completed Special Warfare Combatant-craft Crewman (SWCC) �A� School in Coronado, California, after which he was assigned to Naval Security Group Activity (NSGA), Norfolk, Virginia. In November 2002, Senior Chief Crow was promoted the Electronic Warfare Technician Chief Petty Officer. He was sent to Special Boat Unit TWENTY on temporary duty and served as MK-V Special Operations Crafts (SOC) Privateer Technician in support of MK-V SOC deployments where he deployed to U.S. Central Command in support of Operation Enduring Freedom from March to July of 2003. In 2005, Senior Chief Crow converted to the rating of Special Warfare Boat Operator and was permanently assigned to Special Boat Team TWENTY. Senior Chief Crow was next assigned as Maritime Craft Aerial Delivery System (MCADS) Detachment Officer-In-Charge of Detachment HOTEL and deployed to European Command in support of Operation Enduring Freedom from April until October of 2005. Senior Chief Crow also deployed to Pacific Command as the Detachment Commander for Detachment LIMA from April to October 2007. 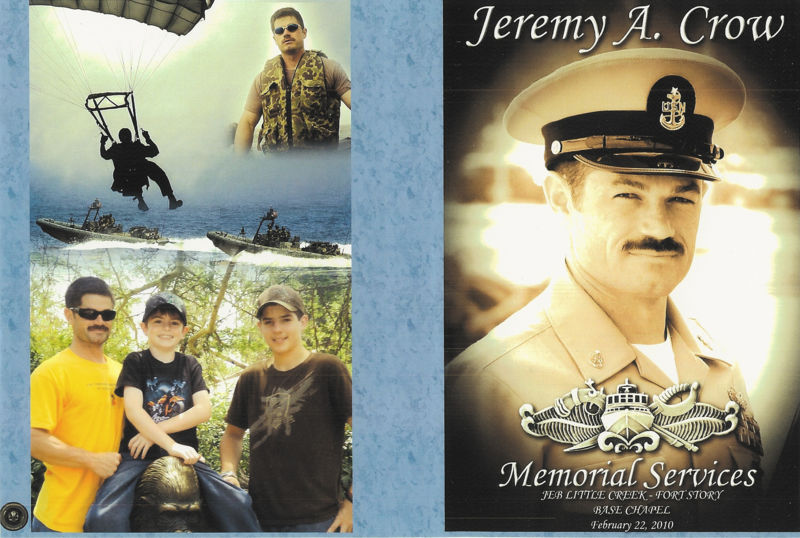 Jeremy was promoted to the rank of Senior Chief Petty Officer on May 30th, 2007. In 2008, SBCS Crow was hand-selected to deploy to Basrah, Iraq, as the Assistant Operations Officer in support of Riverine Task Unit ONE from October 2008 until January 2009. Senior Chief Crow completed his career at Special Boat Team TWENTY as the Operations Department Liaison Officer until he transferred to Naval Special Warfare Group FOUR on December 30th, 2009. Senior Chief Petty Officer Crow showed extreme dedication and devotion to Special Boat Team TWENTY, its personnel, and its mission. His job as a Special Warfare Combatant-craft Crewman Leader carried with it an enormous amount of skill, attention to detail, and most of all, an inherent concern for personnel, their safety and well being in performing high-risk evolutions. The experience and expertise that he displayed will be a model for others to emulate. During his sixteen year career, he qualified as a Special Warfare Combatant-craft Crewman (SWCC), Expeditionary Warfare Specialist (EXW), Military Free-fall Parachutist (FJP), Patrol Officer Qualification, and Enlisted Surface Warfare Specialist (ESWS). Senior Chief Crow�s personal awards include the Joint Service Commendation Medal, the Navy and Marine Corps Commendation Medal (2 awards), and the Navy Marine Corps Achievement Medal (3 awards).